5 assorted Blue sword feather for $25.00 or 5 Assorted White sword feathers for $35.00 Limit of 25 feathers, USA only! These sale feathers might have slight imperfections. This sale will end without notice when all feathers are sold out. Credit cards only. Click this line to order! Why should you buy our peacock feathers! Here's how we get our peacock feathers! If you need to clean peacock feathers, here's how you do it! 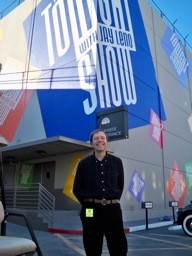 The 10th episode of Mr. Peacock & Friends, (show 210, to see all shows click this line ) of season 2 will show you all the different kinds of peacock feathers on a peacock. You may be surprised that there are many different kinds of feathers on a peacock. On the latest episode of a peacock minute, Mr. and Mrs Peacock tells all about exercising doing peacock feather aerobics. 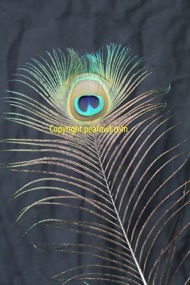 India Blue Feathers, for the person wanting only one feather! 1 Blue feather cut to fit in a business envelope (9.5 X 4 inches). $2.00 plus 2-50 cent USA stamps. Sorry USA only! Only one feather per envelope per address! Only 1 feather per household please. Please do not attach any stamps to an envelope. Send only loose stamps! If you want more than one feather or longer feathers, order from the feather list below! Blue peacock feathers, assorted sizes (our choice) $2.00 each plus postage. Blue peacock feathers, extra long - $3.00 each plus postage. Need your feathers cut to a specific length? Add $2.00 per feather ordered to the above prices. Sorry, wholesale prices not available on feathers. 15 Assorted India Blue feathers, lengths range from 6 inches to 24 inches (our choice) $46.50 (USA only) using PayPal. 1 Extra long India Blue feathers, (or order as many as you need), lengths range from 24 inches to 48 inches (our choice) $18.50 each (USA only) using PayPal. 15 Extra long Indian Blue feathers, lengths range from 24 inches to 48 inches (our choice) $55.00 (USA only) using PayPal. White Feathers, for the person wanting only one feather! 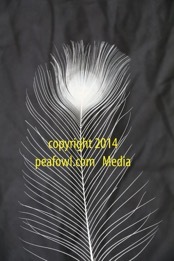 1 White feather cut to fit in a business envelope (9.5 X 4 inches). $3.00 plus 2-50 cent USA stamps. Sorry USA only! If you want more than one or longer feathers, order from the feather list below! White peacock feathers, assorted sizes (our choice ) $3.00 each plus postage. White peacock feathers, extra long - $4.00 each plus postage. 1 Assorted White feather, (or order as many as you need), lengths range from 6 inches to 24 inches (our choice) $18.50 each, (USA only) using PayPal. 15 Assorted White feathers, lengths range from 6 inches to 24 inches (our choice) $61.50 (USA only) using PayPal. 1 Extra long White feather, (or order as many as you need), lengths range from 24 inches to 48 inches (our choice) $19.50 each, (USA only) using PayPal. 15 Extra long White feathers, lengths range from 24 inches to 48 inches (our choice) $79.50 (USA only) using PayPal. Supplies are limited, please e-mail us for availability & amount wanted! 10 Assorted White Sword feathers, lengths range from 6 inches to 30 inches (our choice) $84.00 (USA only) using PayPal. Cameo (Silver Dun) Feathers, for the person wanting only one feather! 1 Cameo feather cut to fit in a business envelope (9.5 X 4 inches). $5.00 plus 2-50 cent USA stamps. Sorry USA only! Chocolate (Cameo) peacock feathers, assorted sizes (our choice ) $5.00 each plus postage. Chocolate (Cameo) peacock feathers, extra long - $8.00 each plus postage. 1 Assorted Cameo feather, (or order as many as you need), lengths range from 6 inches to 24 inches (our choice) $22.50 each, (USA only) using PayPal. 15 Assorted Cameo feathers, lengths range from 6 inches to 24 inches (our choice) $91.95 (USA only) using PayPal. 1 Extra long Cameo feather, (or order as many as you need), lengths range from 24 inches to 48 inches (our choice) $23.50 (USA only) using PayPal. 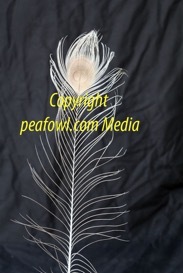 15 Extra long Cameo feathers, lengths range from 24 inches to 48 inches (our choice) $109.50 (USA only) using PayPal. 10 Assorted Cameo Sword feathers, lengths range from 6 inches to 30 inches (our choice) $94.00 (USA only) using PayPal. The India Blue Wing barring feathers come in many sizes. ranging from 2 inches to 16 inches. These hard to come by feathers are of limited quantities as each India blue peacock grows very few of them each year. Add $2.00 per feather if you specifically need a right or a left side feather. Need your feathers in a specific length? Add $2.00 per feather ordered to the above prices. We also sell white, cameo/chocolate sword feathers & wispy feathers in these color types. When paying by check, cashiers check, cash, or money orders, please add an additional $12.95 for shipping and handling in addition to what you order. Native American's regalia have traditionally used real eagle feathers, however this feather is the closest "look alike" to an eagle feather. This has become the closest replacement feather used when eagle feathers are not available. We have very few of these and have a waiting list for these feathers. You may have a one year wait for your needs but please e-mail to see if we can provide you some in less time! White Flight Feathers come various sizes ranging from 6-18 inches long. (our choice) These are popular by fishermen. Sorry, wholesale prices are not available on feathers. (1-2 days) for an additional charge of $45.00 for each box of feathers. You need to add this extra charge to you feather order in your shopping cart if you want USPS Express Mail service. Be sure to check with the USPS web site to see if you get over night service before spending the extra money on Express Mail charges. Add our Zip code of 51553 and yours and they will tell you if you get over night shipping. The Peacock Information Center offers the very best quality of domestic, naturally shed peafowl feathers from our very own birds. Fall brings a bittersweet time on our peacock farm as our birds lose all their colorful tail feathers. However, the harvest of the newly molted feathers are a source of joy for our 100's of clients all over the world. We hope you will become one of our new clients in the very near future and we look forward to your order very soon! 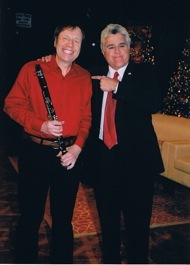 See Dennis Fett & Debra Buck on Attitudes talk show(1990) Starring Linda Dano.